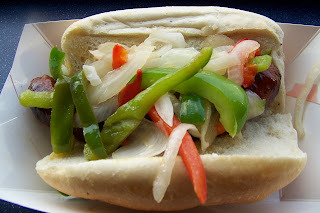 I ordered my first-ever sausage & peppers at a ballgame. 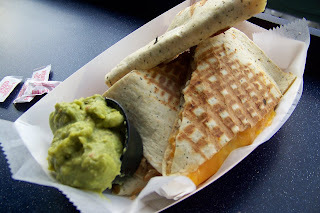 It was pretty good! The sausage (spicy, not sweet) was a bit dry, but still flavorful, and the veggies were outstanding--perfectly crisp-tender, not soggy--you could still taste them! My BF got the burger and fries--the crinkly fries are hands-down my favorite, and these were delicious. Salty, squishy, just right. And of course he shared a bite with me (and I did the same with my sausage & peppers). Thank goodness I got a guy who doesn't mind sharing! 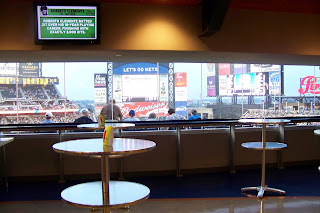 We then left the air-conditioned coccoon of the Promenade Club and took our drinks out to our seats, which were great. 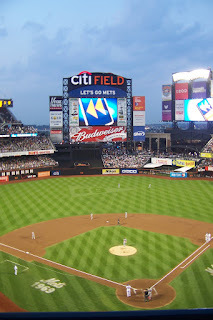 We had an awesome view of the game, which took an Amazin' turn in the 4th inning, when, down 4-0, the Mets scored a remarkable EIGHT RUNS IN ONE INNING! And they held the lead the rest of the game to win! That's what I'm talkin' about!